Despite my fear of heights, I can’t deny that London looks incredible from up high. I’d already faced my fears when I visited The Shard. 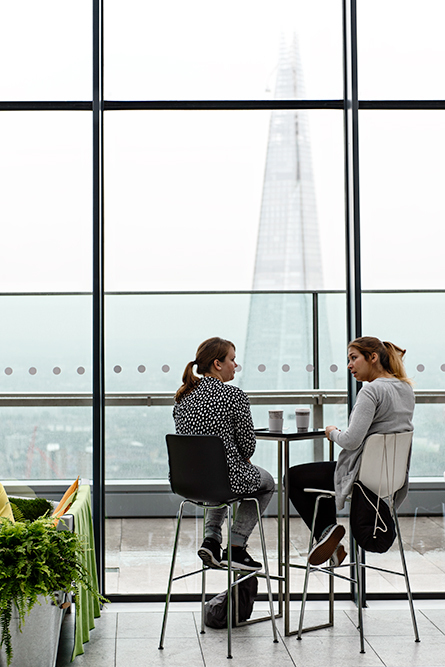 But for a spectacular view of London including The Shard, you need to be at London’s latest panorama attraction: the Sky Garden at the top of the Walkie Talkie. The good news: it’s free! But you need to book a ticket in advance. I had to wait two weeks, but if you want to visit in the weekend you might need to wait even longer. Trying to avoid the crowds I arrived the moment they opened, at 10am. But even at that time I wasn’t the only one. After about a ten minute wait to get in, the lift brought us to the 35th floor. It might be a public garden, but the first thing you’ll notice is all the glass…and the light. It’s a nice, bright open space, that reminded me a bit of an airport lounge (after the passport and security check it might have well been) – but then with better views. Because the views are definitely impressive. Unfortunately due to the strong wind (it was pouring outside) they had to close the terrace soon after I arrived, but when it comes to these heights I don’t mind staying indoors. 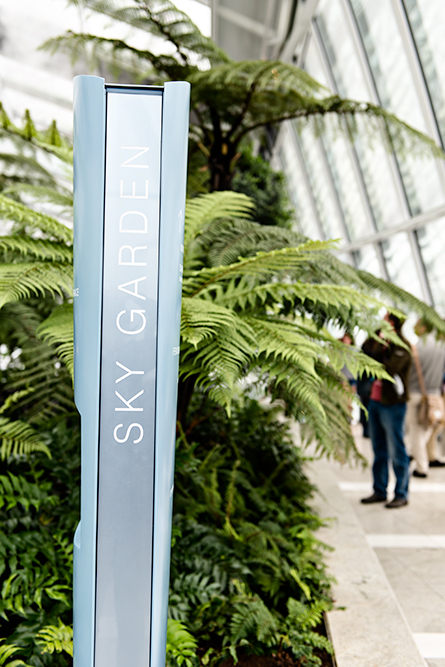 The Sky Garden has three restaurants: a bar with coffee and some snacks, a brasserie and a ‘refined dining’ restaurant. Surprisingly, the bar has the best view. Both the brasserie and the restaurant seemed very nice, but they only have a couple of tables from where you can look outside. After a little less than an hour of walking around, taking photos and even a short coffee break I was ready to leave. In the end it was a bit too much ‘airport’ and not enough garden to really relax and stay longer. It’s definitely worth a visit though. I can’t say I’ve seen anything like this before, and it’s free. It would be a really great place to meet friends for coffee or drinks (I’m sure the sunset is amazing), if it weren’t for the booking in advance policy.